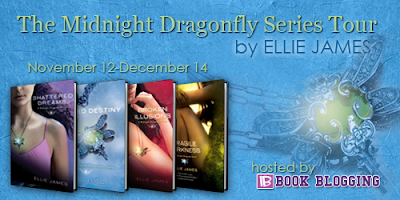 Today, as part of The Midnight Dragonfly Series Tour, hosted by IB Book Blogging, we have the author, Ellie James here to give us a glimpse into her books. She has provided us with a secret scene, a scene from Dylan's point of view. Here's what she has to say about it! Every now and then a character comes along who spins a story in an entirely new direction. Sometimes these characters are planned; sometimes they’re walk-ons. Regardless, they’re not supposed to be important. They’re not supposed to blow up the plot. They’re not supposed to torture the writer. But, inevitably, they do. Dylan Fourcade is such a character. He showed up during the last third of SHATTERED DREAMS, the first Midnight Dragonfly book. He was supposed to be a minor, secondary character. Yes, I intended for him to cause conflict between Trinity and her boyfriend, but he wasn’t supposed to touch her soul—or mine. Heck, there was a strong possibility he was going to die somewhere in the second book, BROKEN ILLUSIONS. reviewers blasted me for pairing Trinity with the wrong guy. But that had evolved into a major part of the plot, Trinity’s struggle with the illusion of perfection, versus the reality of it. Sometimes the right guy comes along at the wrong time, in the wrong clothes, and stirs all the wrong feelings. So anyway, there I found myself with Dylan, with me wanting to know more about him, with Trinity wanting to know more, with readers wanting to know more…except he was like all Mr. Secret Guy. He wasn’t someone who would just sit down and spill all that he knew or was thinking, all that he felt. He had his reasons for trying to stay in the background, in the shadows, all of which blew up in his face as the story barreled on and Trinity’s precognitive visions put her in greater and greater danger. All the while I found myself longing to see the world through his eyes. However, since the stories are told through Trinity’s eyes, I never could. Water beat down against his shoulders. Cold, he knew. The hot never lasted more than ten minutes, and she’d taken most of those. But from the moment he’d pulled her from the river, he’d refused to let himself feel a thing. It was better that way. Safer. She was here. In his apartment. That was not part of the plan. He slammed off the water, just as he slammed off the memory of her parents’ funeral. He’d only been four years old, but their death would forever be a stark line in his life. After running the towel along his body, he draped it around his shoulders, yanked on his jeans, and stepped into the silence. His apartment was long and narrow, three boxy rooms with a narrow hallway running along one side, his bedroom in the middle. He found her in the kitchen, standing in front of the open fridge with her hair wet and slicked back from her face, his favorite black t-shirt dwarfing her shoulders, falling to mid-thigh like a dress. He’d given her a pair of shorts, too, but he saw no sign of them. Her feet were bare. In her hands, she held a beer. The sight of her eyes, wide and exposed, vulnerable in a way that twisted him up inside, drove home the enormity of his mistake. He should never have brought her here. His father’s house. That’s where he should have taken her. She did not belong here. Not now. “You sure about that?” he asked, staring at the beer. He’d put money on the fact it was her first. She pivoted toward him, her eyes going wide and dark the second they met his. Her mouth tumbled open, her chin lifting in that way he remembered from the last time he’d seen her. That was the only similarity between then and now. Damp hair fell against her face. She edged back, keeping the same distance between them—until the her legs bumped the cabinets. He didn’t stop, kept right on eliminating the distance between them. His kitchen was small, so it didn’t take much. Watching him, she brought the bottle of beer to her mouth and took a long, defiant swig. The wince she tried to hide almost made him laugh. Almost. Here in the small kitchen, with the table on one side, the fridge on the other, the cabinets behind her, she looked smaller than he’d realized when he held her along the riverbank. He tried not to think about those moments—or the ones immediately before, when he’d run shouting her name, still several feet away when she screamed and fell into the river. A few seconds longer and the water would have kept her. Refusing to think about that, knowing that it was dangerous to let himself go back to those moments, to feel what he’d felt, he flicked the bottle from her hands. “Come on,” he said as flatly as he could. “Get your stuff.” She didn’t belong in his apartment. No good could come from that. He was taking her to his father’s. Less than half a foot separated them, but he destroyed most of that, moving to stand so close she had to tilt her head up to see him, just like when she’d lain sprawled in his lap along the levee with her hair tangled in his hands. She’d opened her eyes and looked up at him, and for a second there, he would have sworn she knew. She remembered. Everything. Why are you holding me, she’d asked. He’d told her the truth. You asked me to. Someone else, he realized now. When she’d gazed at him like that, with warmth and recognition and longing, she’d thought he was someone else. The other guy, he knew. Chase. The one who had no idea who she really was…the one who’d walked away from her only a few hours before. But he hadn’t realized that at the time. There’d just been he way she felt in his arms and the way she’d looked at him, and the cold, stark realization that he’d almost been too late. I don’t want to go home, she’d said. Now he knew why. “Hiding doesn’t get you anywhere,” he said, and though he meant the words to be matter-of-fact, they came out hoarse instead. “You’re here, aren’t you?” With someone she had no reason to trust. Everything inside him tightened. He tried to read her eyes, to understand what she was thinking—feeling. He was a stranger to her, but that wasn’t what he saw. The faintest trace of recognition glowed there, like a star in a distant galaxy, dim, muted, but bright in its own right, its own time and place. “Maybe…” she whispered—and through some hazy, distorted reality he saw her, saw her stepping closer, saw her pushing up on her toes, saw her lifting her face—but he couldn’t make himself move, couldn’t make himself turn away, not even when she brushed her lips against his. Everything shifted. Roles reversed. He wasn’t the stranger, she was. He wasn’t the one in control, the one making things happen. his mouth to hers and giving her breath. He’d brought her back. Because he knew. God help him, he knew. Things that she could only imagine—dream. Remember. It all burned through him now, an inevitability he’d done his best to whitewash from his mind. “Don’t tell me what I don’t want,” she cried, and God, her voice broke on the words. Tough, brave Trinity. 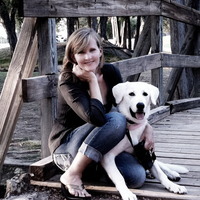 She’d stood there showing not a trace of reaction when his dogs had raced toward her. She’d kept her composure when he pulled her from the river. She’d barely reacted to the revelation that there’d been no one following her, no one with a knife. Not that anyone else could see, at least. She’d kept it together through all that. Until he tried to warn her away from him. He tried to breathe. He tried to make himself take another step away from her. “You’re not thinking straight,” he said gently. He told himself all the reasons he should turn away, walk away. She was free of the past. She was living a new life. She had no idea of the birthright waiting in the shadows, the danger. She was crazy about someone else. That was the only warning she got. He dragged her toward him, his hand finding the side of her face for a fractured second before his mouth came down against hers, and all the pieces from before, the jagged slivers that hadn’t fit together, settled wordlessly into place. This series sounds interesting. Cool tour. Thank you, Stephanie. I'm a big fangirl of the paranormal that exists within our own world. It's been funning exploring all the cool things that can happen when you start getting sneak peeks of the lives around you! A great big thanks to Andye and Amy for hosting a stop on my Midnight Dragonfly series blog tour! I've had so much fun with this series and have enjoyed working on the Secret Scenes. I'm a Louisiana girl, so New Orleans is a place near and dear to my heart. Setting the story of a teeange psychic exploring the mysteries of her heritage amid the backdrop of post-Katrina NOLA has been an amazing experience! Thanks to all who stop by :) Be sure to swing by my Facebook page for all sorts of other contests and scoop! Thanks for the spotlight. I've been wanting to start this series for a while now. Sounds like a fun paranormal read. Sound like a great series! Thanks for the giveaway and the secret scene...Dylan sounds like a great character, I can't wait to check out the series! Hi, librarymom...I'm intrigued by your user name. My mom was a librarian in Louisiana. She worked on books for the blind and also managed the Louisiana Library Association. Lots of great memmories form growing up. Hi, Myrah...thank you! I'm a big fan of paranormal, too, especially all things metaphysical. I hope you enjoy Trinity's story. She grows quite a bit during the three books, starting out as a girl confused by what's happening to her, but quickly growing into someone not just standing on her own two feet, but running on them :) I hope you enjoy! This is a new series and author to me but I like what I'm seeing and reading! What age group are these books made for? I have a young teen, 14...well I guess she'll always be young to me...and wanted to know if this was appropriate or not? I can't wait to read the books, though! I really liked the first book and knew the second one was out, but didn't know that the third one would be out soon. Guess I need to catch up on the series. :) Thanks for the great excerpt and chance at the giveaway. These books sounds wonderful. Would love to read them! Hi, LilMissMolly...thank you! Let me know if you'd like some swag! Hi, Sabryy...thanks for stopping by! I'm so looking forward to reading this series! Hi, Ariel...thank you! I hope you enjoy! I love Midnight & I think that a Dragonfly is one of the most beautiful creatures ever made by God. So how can this series be bad.